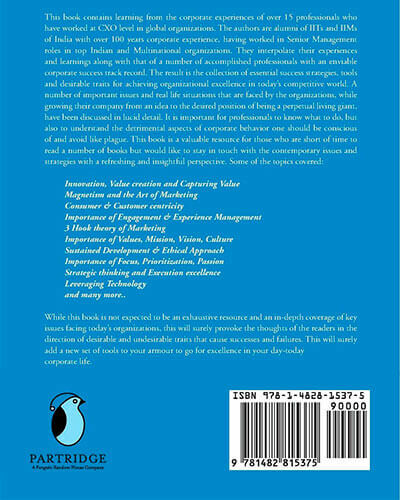 Successful Organization In Actions aims to throw light on those success factors that have led the organizatiions to achieve tremendous results and achieve growth and glory.Through the eyes of seasoned and battle hardened professionals with more than 100 years cumulative experience in a number of successful companies,the book tries to expose to the readers a number of conventional and non conventional activities,strategies tools and approaches that are employed by today's successful organization to create new markets,outwit competition and create lasting value. A visionary company is built around principles. The underlying core ideology or the vision of the company is the foundation on which the Organization grows. While adapting and evolving as per the market needs, the brand values remains consistent. Coca-Cola has been in the market since 1886 and performed remarkably well maintaining its brand positioning, but sticking to its core vision of ‘Bringing to the world a portfolio of beverage brands that anticipate and satisfy peoples; desires and needs. The best organizations are built around frameworks and systems. These companies are built around processes and frameworks that enable them to scale, replicate businesses and stay as market leaders. Some of these large incorporations have well structured and documented processes that made it possible for them to create a global footprint for a sustained period. Great Organizations are built on methods rather than individual brilliance. These systems are incorporated into the heart of their business and responsible for their strong positions for long time. They focus on knowledge sharing and building a continuity culture. These Organizations like 3M, Coca-Cola, GE etc have processes in place that make succession planning smooth. Trust is built when customers are able to derive value from companies’ products and services over a sustained period of time. An amazing success story in recent times is that of Amazon. It started in 1994 and has redefined the way people purchase things. The trust has been built steadily by empowering the user with the power of informed decision-making and feedback. Ethical approach, value driven culture, concern to society, sincerity of purpose, unquestionable integrity make these organizations, a great companion to repose your trust on and make them the first choice to deal with, for any of your requirements. Great companies are ever vigilant to keep track of the changing market. They not only adapt to changes but also create a viable market through proper channels. Corning, a manufacturer of specialty glass products for last 160 years, analyzed the fast changing market opportunity. They are now one of the major suppliers for smart phone and tablet screens. Most of the old companies do not evolve with time but the leaders emerge even stronger by creating opportunities. Creating an environment that promotes and encourages experimentation. Great innovations are results of endless experimentation and great companies prove it time and again. 3M started as a mine and failed miserably. The first president could not get a salary for 11 years. Yet with time it became one of the most innovative companies, with more than 60,000 products to its credit. Any business revolves around the customer. The idea is to make the customer happy with the best products and services. Innovation that does not provide value to the end user is not worth it. GE has introduced goodwill and customer satisfaction program wherein GE Six Sigma black belts/management experts assist their customers in streamlining processes, cutting costs and resulting in optimized businesses for their clients, all free of cost. No wonder GE leads the pack among companies that score high on customer satisfaction. Technology giants like Google, Amazon are other great examples of companies wooing the customers by their excellent service. Successful organizations master the practice of translating thoughts and ideas into actions with speed, accuracy and cost effectiveness. This ensures that they are always ahead in the game with respect to their competitors in reading the market and in doing what is needed to always lead the same. Always, challenging the limits, continuously striving for excellence, never resting on past laurels are some of the hallmarks of thriving organizations. Successful Organizations are always conscious of the fact that they are meant to exist for generations and hence their strategies and tactics revolve around the long-term nature of their outlook. They are environmentally conscious and always adopt the TBL (Triple Bottom Line) approach of caring for People, Profits and Planet. It is not just profit alone that is the reason for existence at ethical, thriving and successful organizations. Environmentally friendly policies that will enable us to pass on a more habitable planet to our offspring, taking care of the society and working for the development of the people by focusing on corporate social responsibility will lead to a tremendous goodwill for the organization and higher valuations leading to sustained growth for the business. WHAT MAKES THE 21 ST CENTURY DIFFERENT? We are now living in an era, which is strikingly different from earlier centuries. What we used to achieve in centuries, we are in now in a position to achieve in decades and what we could achieve in decades, we are in a position to achieve in less than a year. Innovations like ‘Electricity’ and ‘Internet’ have been at the root of most of the progress the mankind has made and responsible for tremendous boost in the productivity levels. The revolution in the telecommunication area has made, what was considered to be the staple diet for fiction writers, turn into reality. Robotics, Networking, Cloud computing, Telepresence, Extreme Mobility solutions, Individualized customer targeting, Unforeseen Customer Experience Focused capabilities, GIS, Big Data, Exploration of the universe and search for alternate locations for habitations etc are but few of the numerous innovations and discoveries that are being made and facilitated. Ever wondered how some organizations’ scale up infinitely, smoothly and systematically while some organizations implode being unable to manage the growth? The analogy can be found in the operation of our Solar system. Our solar system consists of a number of celestial bodies like the stars, the sun, the planets, the satellites and many more. Our solar system is a well-oiled machine with planets rotating around themselves to create day and night, deriving source of energy from the boss of the Solar system, the Sun, & revolving around the Sun with clinical precision to result in the days, the years and the seasons. The planets in turn have their own satellites revolving around them by keeping safe distance among themselves. Any organization that wants to grow infinitely without any hiccups has to put in place such a foolproof system that is followed with precision and periodicity leading to predictable growth. Any organization that wants to grow infinitely without any hiccups has to put in place such a foolproof system that is followed with precision and periodicity leading to predictable growth. What we see here is the requirement of a set of Structures, Systems, Rules, Hierarchy, Processes planned in detail and executed to perfection. This will help when the organization experiences spurts of growth and also help it fix problems easily by isolating and addressing them when they occur. Where else could we get learning’s on Globalization, or should I say Universalisation, than the example of the Universe itself. The starting point of the journey has to be a Deep Passion, A Strong Desire to take on the challenge of expansion or, depending on the scale, Globalization; only the variables & complexity increase. It is essential that a Leader has the Drive & the Vision which leads & guides the organization towards the future. A Leader then, is ‘a person who leads’ & Leadership is the ‘ability to be a Leader’. A Leader is also expected to have, depending on the field of operation, Business, Functional or Domain knowledge, specific to the area of operation. A good definition of Leadership that I came across is ‘A Leader is someone you choose to follow, because you know that he/she can take you where you want to go, but cannot go alone’. However, talking of Good Leadership, there is also the concept of ‘Situational’ Leadership. According to this, the approach should be changed depending on the context or situation. An approach valid in one situation may not be valid in another. So, a slightly broader view, encompassing more variables is proposed. Leadership should look at a much wider context… social, economic, psychological, physical… a holistic systems approach. Good Leadership, at the cutting edge, is Life itself!! Like in life, a Dynamic Balance of various aspects has to be maintained… between yin & yang, masculinity & feminity. Good Leadership needs to attain a balance between social, economic, physical & psychological variables. In most situations we see one-dimensional excellence at the cost of various other dimensions. Shiv Nadar (born 14 July 1945) is an Indian industrialist and philanthropist. He is the founder and chairman of US$6 Billion HCL and the Shiv Nadar Foundation. Shiv Nadar founded HCL in the mid-1970s and transformed the IT hardware company into a globally successful IT enterprise over the next three decades by constantly reinventing his company's focus. In 2008, Nadar was awarded Padma Bhushan for his efforts in the IT industry.Shiv Nadar, nicknamed by friends as Magus (Old Persian for "wizard"), since the mid-1990s has focused his efforts on developing the educational system of India through the Shiv Nadar Foundation. John Francis "Jack" Welch Jr. (born November 19, 1935) is an American chemical engineer, business executive, and author. He was chairman and CEO of General Electric between 1981 and 2001. During his tenure at GE, the company's value rose 4,000%. In 1999,Fortune named him the "Manager of the Century",and the Financial.Times recently named him one of the three most admired business leaders in the world today. Sunil Bharti Mittal (born 23 October 1957) is an Indian telecom mogul, philanthropist and the Founder , Chairman and Group CEO of Bharti Enterprises. He was the first indian entreprenuers to identify the mobile telecom business as a major growth area. "In 2006 ,he stuck a joint venture deal with Wal-Mart,the US retail giant,to stat a number of retail stores across India. In 2007, he was awarded the Padma Bhushan, India's third highest civilian honor. TITANIC which was supposed to be an unsinkable ship,sank without a trace after hitting an iceberg in the early hours of April 15th,1912 in the North Atlantic seas. In the recent history,we have seen a number of large companies which were successful in thier own way for a long time,suddenly losse way and disappear from the corporate landscape.While a number of factors have to fall in place together to create a successful organization,a few factors are sufficient to cause the companies to fail,just like how a few unplugged leaks caused by a rock hit could sink a huge ship if not plugged in time. It is imperative for businesses to stay in touch with their customers and needs. Understanding the changing needs of the customer is a sure fire way for innovation. Most companies around the world that are innovative conduct a series of experiments to help create new products and services or improve upon existing ones. An idea that is translated into the product or service for the consumer is innovation. Successful companies create an environment where people are encouraged to come up with new ideas that improve the existing processes and solutions. When people collaborate and intermingle they tend to come up with great solutions. Everyone is not an expert in everything, the idea is to make people learn from each other and build a synergy. The best companies hire the smartest workers, train them and create an information pool to build the best products and services. The most passionate people end up creating the most innovative products. The key to innovation lies in its execution. Ultimately, the ideas that bring value are those that get executed. Founder Director ,Sunya Circle-Authentic Leadership Training Associates.A product of IIM Ahmedabad,Jaspal enables Organizational Excellence and an accelerated Leadership pipeline.He is focused on areas such as Authentic Leadership,developing a Global mindset,Winning Team Culture and Executive Well-being. Jaspal Has an outstanding track record as P&L Head with global organizations like Nestle,Bausch & Lomb,Marico and Dr. Reddy's Laboratories. Having worked in Canada,Europe,India and the BRIC markets,he has a wide international exposure. Share the book with your friends. We at Kreyon believe in spreading light, colour and creativity in the lives of people around us using technology as a medium. We work day and night to convert our dreams to reality. Whether it is our customers, employees and people around us, we believe in enhancing the world by writing world class software and providing excellent services. We create educational ERPs and mobile applications using state of the art technology. As organizations continuously reinvent themselves, the successful organizations are those that stand the test of time by sticking to timeless principles of eternal success at the same time balancing their urge for financial profitability, positive contribution to humanity and corporate sustainability. 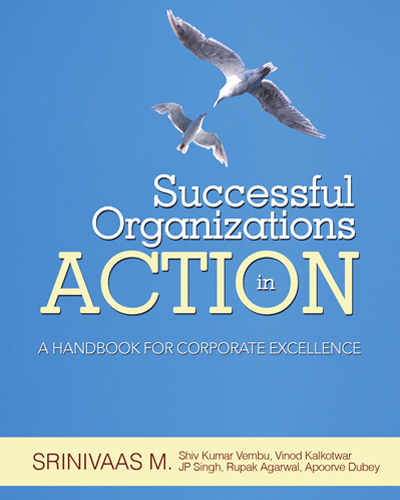 SUCCESSFUL ORGANIZATIONS IN ACTION is an exciting effort from us to throw light on these fundamental principles of success as seen through the eyes of seasoned corporate professionals from their first hand experiences gleaned from over 100 years of corporate experience.